The Senate Commerce Committee went out of their way today to strip Kansas public employees of the right to control their own paychecks and prevent state and municipal employees from having a real voice in their wages, hours, and working condition. On a motion of Senator Denning (R-Overland Park), the Committee gutted House Bill 2096 and inserted into it the contents of SB 179, ending the Public Employee Relations Board and enacting severe limitations on collective bargaining rights for state and municipal employees, and Senate Bill 212, prohibiting all public employees from paying association or union dues via payroll deduction. By putting these two anti-worker bills into the House bill, they successfully stop the House from any ability to have the bills heard in committee or ended. The House can only vote up or down on the bill on a motion to concur in the Senate changes. This end run around the legislative process is commonly known as railroading or ramrodding. It was used to pass the school finance bill that ends the current formula and cuts funding for most school districts. This bill is the latest in the war on public employees being waged by conservatives in the Legislature. So far they have prohibited public employees from using payroll deduction for PAC contributions, ended fair dismissal rights for teachers, attempted to repeal the professional negotiations act, reclassified state employees to end fair dismissal rights, and now voted to dismantled protections in PEERA (bargaining for state and municipal employees) and ban payroll deduction for dues. This bill now goes to the full Senate for consideration. If it passes the Senate, it will go to the House. We are almost out of time for consideration so the votes are likely to happen in the next couple days. Click here for a roster of Senators with phones and emails! Phone them and leave a message. THEY MUST HEAR FROM KANSANS EVERYWHERE! Once you have phoned, send an email. 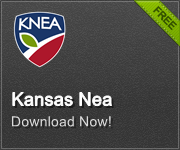 Click here to access the KNEA legislative email portal. I do not need big government to protect me from my own decisions. I work hard for my pay and I should get to decide for myself how to manage it. HB 2096, as passed out of the Commerce Committee, prohibits me from making voluntary payroll deductions. How can government restrictions on my choices possibly be good policy? Local communities and local governments should be free to make their own decisions about how to manage employee relations and payroll systems. HB 2096 undermines local control. This bill is mean-spirited and unjustifiable. I ask you to stand up for the people who police our streets, fight fires, teach our children, and serve our state and community. VOTE NO on HB 2096. Earlier this session both the House and Senate passed bills that would amend the Professional Negotiations Act. The plan passed by the House, HB 2326, is the one that was crafted collaboratively by KASB, KNEA, USA/KS, and KSSA. It changes some dates in the law, requires salaries to be negotiated annually, and allows both the board and the bargaining unit to choose five additional topics to negotiate from the current list of mandatorily negotiable items. The plan passed by the Senate, SB 136, changes the dates in the law, requires salaries and hours to be negotiated annually, and allows both sides to bring three additional topics from the list of mandatorily negotiable items. No action has been taken by either chamber on the other chamber’s bill. So today, the Senate Education Committee took the Senate’s version and put it into the House bill, HB 2326. The now amended House version will go to the Senate floor. If it passes the Senate (and it did as SB 136 on a unanimous vote), it will go over to the House for a vote to concur or non-concur in the changes. If the House concurs, the bill goes to the Governor; if they non-concur, they’ll go to a conference committee on the topic. The House Education Committee did some heavy lifting today, taking up five in the backlog of bills they have to handle. Senate Bill 8 simply repeals an outdated requirement for school district audit teams in the Division of Legislative Post Audit. The bill is non-controversial and was passed and placed on the House consent calendar. Senate Bill 93 cleans up a higher ed provision for performance based funding in CTE programs at the community colleges. A bill last year applied to all the community colleges except Johnson County which had been expected to be dealt with separately. Since the separate bill did not pass, this bill simply adds Johnson County Community College to the list of colleges eligible for the funding. Senate Bill 70 requires that all school employees be subject to fingerprinting and background checks every five years (upon license renewal for teachers). Teachers have already been fingerprinted and have undergone background checks but not all other school employees. The bill generated a lot of discussion regarding the cost and of such frequent checks and whether or not they should also require them of volunteers and college students who have contact with children. The most discussed issue was the cost and who should pay the bill. In the end, the bill was amended so that the roughly $50 fee could be paid by either the employee or the school district (it will be a local decision) and that the innovative districts were treated the same as all other districts. Originally teachers in innovative districts had the fee paid for them. This bill now goes to the full House for consideration. Representative Hedke offered an amendment that would grandfather in all such students down to current year high school sophomores and then disallow the in-state rate in the future. This amendment passed on a 10-9 vote with Chairman Highland breaking the tie. Representative Trimmer (D-Winfield) offered an amendment that would require businesses to use the E-verify system to ensure they were not hiring illegal aliens. The rationale is that if there are no jobs being offered to them in Kansas, they won’t come and the whole issue of in-state tuition is moot. This was a really interesting amendment in light of today’s action by the US Attorney on several businesses in Kansas allegedly paying illegals aliens. Before the Trimmer amendment was voted on, Representative Dierks (R-Salina) made a motion to table the bill. “I think,” Dierks said, “that we will regret voting for this bill.” The motion to table passed, putting the bill on the shelf. The last bill taken up was Senate Bill 60 which would allow homeschoolers and private school students to participate in KSHSAA activities in the public schools. One of the big issues in the bill is how to assess the academic performance of home schooled students as required of public school students participating in such programs. Rep. Tony Barton (R-Leavenworth) offered an amendment that would exempt Sedgwick, Shawnee, Johnson, Douglas, and Wyandotte Counties from the bill. The amendment failed. Trimmer then made a motion to table the bill until next session when a subcommittee could be formed to study and make recommendations on assessing the academic performance of students who wish to participate in these activities in the public schools. The motion to table passed and the bill is on the shelf until next year. Celebrate Freedom Week Day 1! Due Process Bill Moves! Transparency (n.) – when Kansas extremist legislators admit to open attacks on public education.